It Is What It Is: Snow Day! For the families of teachers, there are few events more highly anticipated than the "snow day". In fact, as an adult, I find myself more excited by Joel's unexpected days off than I did as a child, learning that school was canceled due to copious amounts of snow or freezing drizzle that covers the street, house and what's worse-- the satellite dish, leading to no where to go and nothing to watch. The modern convenience of my iPhone by my bedside with the local news "cancellations" list as one of my bookmarks has streamlined the process even further, allowing me to plan the course of my morning without ever leaving my bed. So far, this post really makes me sound lazy. Perhaps I need to find new motivation in my life. Let's start by changing my bookmarks to reflect a new, more ambitious lifestyle. It's too bad I didn't have my sights set that high last Monday when Joel was off from school. A layer of ice above a dusting of snow proved too much for the school buses when it lay atop the melted and then re-frozen snow of the previous week. Although the weather was less than ideal, we could see that the main highways were clear and dry so we took the opportunity to make a quick trip into town to locate some snow pants for Cael who had been begging to make a snowman for weeks. 4T or 5T? 4T or 5T? I had the traditional mental battle with myself as I debated which pair of snowpants would allow me two years' worth of snow day fun as I stood in front of Walmart's only display of (surprise, surprise) camouflage-patterned winter gear. Once home, we put the kids down for a nap and Joel and I managed to successfully waste away an afternoon of unexpected free time with Grand Theft Auto and Pinterest, respectively. 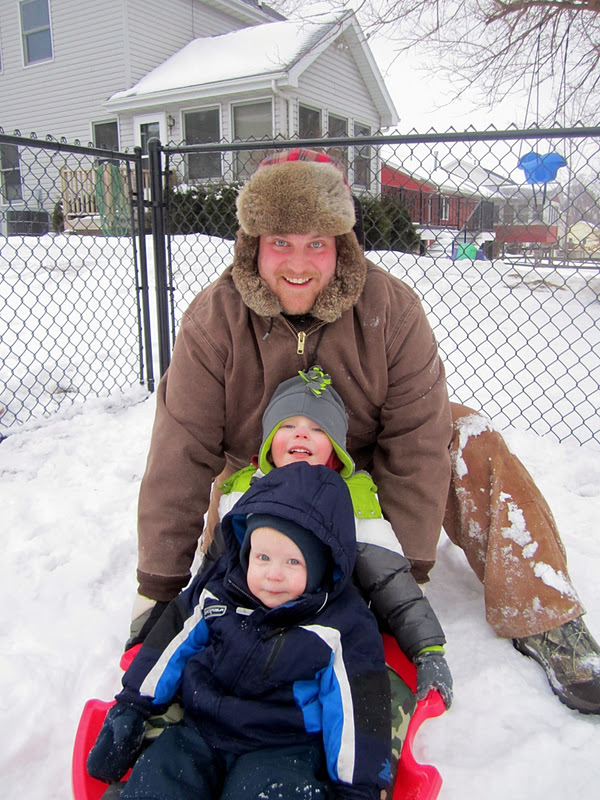 By about 3:45pm, I tempted fate and got the boys up before they were done sleeping so that we could do some sledding and snowman assembling, a rare treat with Daddy by their sides. But it wasn't the kind of treat I had in mind. I've mentioned the difficulties in dressing the boys for playtime in the snow, but the more I do it the more I have come to equate it to squeezing a seal into a size 4 shoe. It's tricky, it takes forever, and you're likely to get slapped in the face. Once we got all 49 layers of waterproof fabric on their skin, we scaled the only incline in our backyard so that we would have a valid excuse to shove the boys down a hill at speeds in excess of 70 miles per hour. First we sent Cael to blaze a path, then Graham, who ran square into Cael, then Oscar who would rather have five more teeth pulled than lose his footing, Cael and Graham together and finally, one more almighty push for Graham which sent him halfway across the backyard and peeled his face back thanks to the sustained g-force of his descent. After they'd tired of sledding, we made the trek around to the front yard like a 19th century farmer following a stretch of rope between the house and the barn. Despite the fact that the weather was sunny and miraculously above freezing, the boys barely walked upright, tousled around by the nonexistant wind and tripped repetitively over their thick boot-laden feet. When the rope ran out in the front yard, we set up camp to make a snowman, or more accurately, an ice/dirt/leaf/snow mound; a memorial for all of the marriages that dissolved thanks to disgruntled children and sub-zero temperatures. Unfortunately, our snowman never developed past this mound stage as the snow was as ineffective at packing as Graham is unable to keep his clothing on while playing outside. "Graham, where are your gloves?" "But where is your hat?" "And where is your boot...?" Does anyone know if CPS considers frostbite to be "willful neglect"? With the sledding a bust, the snowman a failure and simple walking a test of our patience, we threw our hands in the air and asked the boys to pose for one quick picture before heading inside. And Graham shoved snow in Cael's face. I'm sure he had it coming. The kid has a serious backlog of offenses for which he needs to make restitution, so I pretended like I didn't see it happen. Once inside, with all of the wet, snowy gear in a big heap on the carpet because that is the place where it can make the greatest mess, our shivering boys sat next to the fire and I made a big pot of homemade hot chocolate. 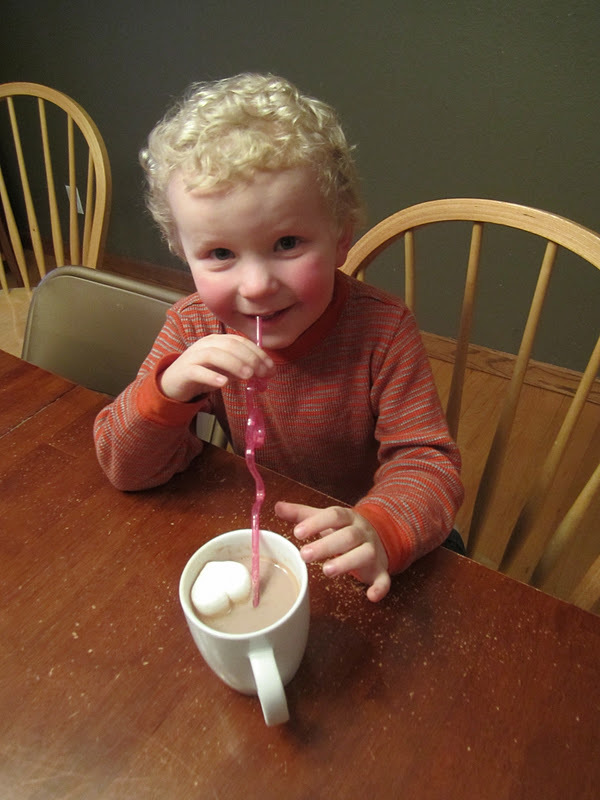 So there we sat, laughing at the table together as our numb toes tingled and Cael and Graham fought over the extra marshmallow. It may not have been the memory-making snow day I'd hoped for, but in the end it was perfect in its own way. Scratch that. I'm ready for spring. Cute pics! Was that a heart shaped marshmallow? I want one! Shawna- Yep, I did! I just got them at Walmart... in a mixed bag of pink and white. Those ran out and I just got another bag of all pink ones... and they are strawberry, too! Shaz- I wish I could claim the marshmallows! I have made homemade marshmallows before, but these were store bought. And some were strawberry flavored! So yummy! We did! I'm glad Graham isn't the only little exhibitionist in the world!